In this article the author aims at analysing the evolution of Mozambican journalism, since 1990 (when the new Constitution was approved) until today. The key hypothesis is that Mozambican journalism has been strictly related to Mozambican democracy, and that in 1999-2000 there has been important facts which have determined the option for different avenues from the side of private and public press. After giving a short framework on the political situation in Mozambique, the article focuses its attention on the legal basis of Mozambican media freedom, stressing the limitations that, till today, it continues to register. 1Mozambique has been considered, in the few past years, an admirable example of how a country, which in 1991 ranked as the poorest in the world, has been able to leave poverty, building a pluralist and inclusive model of democracy, after a 16 year civil war that almost completely destroyed the country. 2The great trust of international community in relation to the new Mozambique has been demonstrated by the very consistent aid it has received over time, following the General Peace Agreement signed by Joaquim Chissano, former President of the country, and Afonso Dhlakama, the leader of RENAMO (Mozambican National Resistance), in Rome in 1992. Implementation of the peace agreement cost the UN about 1 billion USD (Caporale, 1994). In 2009, international donors decided to join their efforts in a “Troika” of 18 countries, applying their financial aid directly to the Mozambican budget (De Rienzo & Hanlon, 2007). 3The international image of Mozambique grew quickly. All the economic indicators became positive. From 1994 to 2009, the country registered an average annual growth of 8% in its gross domestic product (GDP). As an important American institution enthusiastically commented, this represents “one of the best growth records for any non-petroleum economy in sub-Saharan Africa over this period” (US Embassy in Mozambique, 2012). In bilateral trade with the United States, the growth recorded touched $487.9 million, an increase of 68% in comparison with 2010 (US Embassy in Mozambique, 2012). The most important economy in Europe, Germany, also stressed that “Mozambique has emerged as one of the fastest growing economies” (Deutschen Gesellschaft für Internationale Zusammenarbeit, n.d.). 4Despite this excellent economic performance and the perspectives opened through the discovery of great coal seams and gas fields, between 1997 and 2004 Mozambique did not see “any substantial increase” in domestic revenues that constantly fluctuated around 12% of its GDP (De Rienzo & Hanlon, 2007, p. 3). In 2002, the financial dependency remained very high: 60% of the state budget was supported by Troika aid. In 2011 this level was 45% (Bertelsmann Stiftung, 2012). 5According to several researchers, mega-projects and the “industry of development” would accentuate Mozambique’s dependency on foreign capital (De Brito, Castel-Branco, Chichava & Francisco, 2010; Hanlon, 1991, 1996, 2004; Hanlon & Smart, 2008; Macamo, 2004). 6Recently, “the close overlap between state, party, and economic elite, which goes hand in hand with personal enrichment and high levels of corruption” created the conditions to exclude a significant part of Mozambican population from the benefits of economic growth, as clearly demonstrated by the fact that the poverty rate did not fall in the last years, going from 54,3% in 2003 to 54,7% in 2010 (Bertelsmann Stiftung, 2012). 7In the political field, Mozambique is considered today to be a “hybrid democracy” (for definition see below), occupying the 100th place in the Democracy index in 2010 and 2011 (The Economist, 2011), but with a weak score in the category of “Electoral Process and Pluralism”. In the Press Freedom index, in 2011-2012, Mozambique reached position 66 (out of 179 countries), moving up from 98th place in 2010 (Reporters Without Borders, 2012). In 2013, the country saw a fall, being classified in 73th place in the world (Reporters Without Borders, 2013). 8Despite some exceptions, most experts comment favorably the democratic advances in Mozambique. Rønning defends that “the awareness of the legal provisions for a free press and reports on violations has been systematically increased”, and that Mozambican journalists are more confident “about their rights” (Rønning, 2009, p. 249). The African Media Barometer states that the country has an encouraging situation in the field of freedom of expression, including press freedom, as shown by the current number of conventional and electronic newspapers, and TV and radio stations (Friedrich-Ebert-Stiftung & Media Institute of Southern Africa, 2011). This qualitative report also observes that some problems continue to characterize the media environment: an atmosphere of secrecy, a lack of specific legislation on broadcasting, the public nature of important broadcasting bodies, such as Rádio Moçambique (RM), Televisão de Moçambique (TVM), the newspapers Notícias and Domingo, all considered to be limitations to press freedom. In general, despite these aspects, the situation is positive and optimistic. 9This article aims to demonstrate the direct connection between the development of Mozambican democracy and the evolution of media freedom. Based on a qualitative methodology as well as on scientific literature, this research analyses Mozambican newspapers, with the pivotal support of interviews with local journalists carried out in Maputo between July and September 2013. 10In order to demonstrate the hypotheses presented below, the main concepts used are the following: firstly, the concept of a “blocked democracy”; secondly, the concept of “political risk”; finally, the concept of “media freedom”, which is related to the first two. They will be summarily explained throughout the article. 11Three main hypotheses are formulated here. The first one is that after the General Peace Agreement in 1992 and until 1999, Mozambique set up an implicitly “blocked” but advanced model of democracy. The second is that after the second general election,held in 1999, and its consequences, Mozambican democracy has revealed its real nature as a “blocked” system, diminishing its spaces of pluralism and tolerance. The last is that the Mozambican media – particularly the ones directly controlled by the state – was strongly influenced by the scheme of the “blocked” democracy mentioned above and then by its transformation. 12The three hypotheses presented will be summarily explained in the first point; in the second, the article will present a brief framework of the legal basis for media freedom in Mozambique, in relation to the democratic evolution of the country; in the third, an analysis of the relations between political power and the media throughout the nineties will be presented; the fourth point will show the influence that the 1999 general election and its consequences had in the field of press freedom. The article will end with some final remarks. 13Many definitions have been given for the nature of Mozambican democracy. Inside the model of a “hybrid” democratic system, some scholars have defined Mozambican democracy as a good example of “competitive authoritarianism” (Levitsky & Way, 2002). According to this model, free elections are held, but “journalists, opposition politicians, and other government critics may be spied on, threatened, harassed, or arrested” (Levitsky & Way, 2002, p. 53). Multiparty elections cannot represent, by themselves, the key indicator for determining the democratic nature of a regime, since they “may simply prove to be one-time-only vehicles through which governing elites consolidate their domestic hegemony” (Braathen & Orre, 2001, p. 2). 14Some classic definitions of African democracy (Bayart, 1993; Chabal, 1998) can explain at least some of the Mozambican democratic features, as recently observed: “the close overlap between state, party, and economic elite, which goes hand in hand with personal enrichment and high levels of corruption” represents a clear development in the socio-political asset of this country (Bertelsmann Stiftung, 2012). 15In this article, the main concept used will be the one of Mozambique as a “blocked” democracy. It will function as the first hypothesis too. 16Generally speaking, this expression depicts a very particular kind of democracy, according to which the opposition parties (or more often party) cannot have a real chance to govern the country, despite the existence of a free and fair electoral competition. This is for historical reasons and although they can be of a different nature, it generally relates to particular international situations. For instance, in Italy, from the end of the Second World War to the end of the “First Republic” (1992), the main European Communist Party (PCI) had no chance to rule the country due to the geo-political context of the Cold War. The same situation occurred in many other Western countries, such as France and Germany, whose main opposition leftist parties would only be part of the government after adopting a social-democratic mainstream stance. 17This model of “blocked” democracy has a specific tolerance limit. It is represented by the definition and management of a “political risk” as the likelihood for the main opposition party to win elections. This concept of “political risk” is considered basically from the point of view of the Government which, in the case of Mozambique, can be identified with FRELIMO. This possibility does not exist, in spite of the transparency and fairness of the mechanisms that regulate the electoral process. The case of Italy is elucidative: the system was able to avoid the “political risk” (a central government ruled by the Communist Party), but not its own implosion, with the end of all the old parties of the “First Republic”, from Democrazia Cristiana (Christian Democracy) to PCI. 18Mozambican democracy can also be defined as “blocked”. It means that, in theory, RENAMO had the same chances to win elections as FRELIMO. In truth, it was impossible for RENAMO to govern Mozambique, since its victory constituted the main “political risk”, which the system could not tolerate. In what sense did RENAMO constitute the unacceptable “political risk”? It was due to domestic and external factors. Firstly, RENAMO had always been represented as a simple group of “armed rebels”, financed by the apartheid regime of South Africa, who lived in the bush and destroyed the country and who were totally incapable of managing the country. Ironic speeches were made about its leader, Afonso Dhlakama, discussing his academic level and saying that he did not finish the fifth year of school. The bureaucratic system was completely in the hands of FRELIMO, and it would not have accepted a state ruled by Dhlakama and his rebels, who killed innocent people all around the country. Ethnic reasons also had great importance in the definition of RENAMO as the “political risk” in the Mozambican system: despite the construction of the national ideology as anti-tribal, the Mozambican State had been set up by two main ethnicities: the Makonde warriors of the North and the Ronga of the South. All the four Presidents of FRELIMO (Mondlane, Machel, Chissano and Guebuza) were Ronga, and all (with the exception of Mondlane, killed in 1969) became President of Mozambique. With rare exceptions, the representatives of the other groups (especially Ndau, Sena and Makhwa) were excluded from the management of the State and often marginalized or even persecuted, like Uria Simango or Joana Simeão (Ncomo, 2003). RENAMO’s victory in the election would mean a complete reverse of this ethnic geography of power: neither the Makonde nor the Ronga could allow it. The second factor that contributed to defining the limits of Mozambican democracy and its risk is related to the international context. The image of RENAMO and its leader on an international level was very bad: as a man who was more closely linked to Ian Smith’s Rhodesian regime than to the South African apartheid one, he could not govern a strategic country like Mozambique. He was considered politically “primitive” and unreliable. Two examples of this image – which he helped to create – can be extracted from the peace negotiations and from his attitude during the first free elections in 1994. In the first case, the General Peace Agreement was delayed many times because of his habit of wanting to discuss issues that the parties had declared closed (Rocca, 1994). In the second, just one day before the election, he encouraged Mozambican citizens not to vote, foreseeing frauds and a lack of transparency in the electoral process. Only the strong intervention of the international community convinced him to give up this idea, even if the elections had to be delayed for a day because of the confusion he had induced in the voters. Therefore, his best result could be to be admitted to the Mozambican political arena, but with no real chance of winning. In this context, no one could consider the possibility that this “political risk” could occur to be realistic. Neither FRELIMO nor the international community were prepared for this scenario. 19Within these implicit boundaries, the quality of democracy in Mozambique was improving. 20An “explosion” of many entities occurred in few years, as a demonstration that Mozambican society wanted to live in the new atmosphere of freedom and peace. National, and non governmental, organizations were set up and grew: in 1990, there were only 12, in 1993 87, and in 1995 more than 100 (Alden, 2001). Many small parties were formed, in order to compete in the first general election; private media groups were born, thanks to prominent journalists who decided to leave the public sector, especially the AIM (Mozambican Agency of Information), to experience the excitement of the news market. At the academic level, the monopoly of the University of Eduardo Mondlane ended, thanks to several initiatives: on the one hand, the state founded other universities, such as UP (Pedagogical University), ISRI (Higher Institute of International Relations), ISCS (Higher Institute for Health Sciences) and others over time. On the other hand, the “explosion” came from the private sector. Today, Mozambique has around 40 official higher education institutions, scattered all around the country. The same occurred in other key sectors such as medical assistance. Private clinics began to grow, attracting an incipient middle class. This same class demonstrated a certain sensitivity to some new issues, such as environment and, even more, human rights. 21The electoral system was drawn up to confirm this new climate of peace and expression for all the trends present in the country. The 1990 Constitution (Article 107) established a majority system, according to provincial criteria. RENAMO rejected this principle during the Rome talks, imposing proportional criteria, with a national threshold of between 5% and 20% (Nuvunga, 2006). The electoral law would opt for a minimum threshold (5%), 250 seats in the Parliament, and a CNE (National Electoral Committee) President “chosen by and from civil society” (Lundin, 2004, p. 105). 22On the other side of the coin, the institutional system was highly concentrated in the hands of the Head of State. As Shenga remembers, the President of Republic is also the head of the government and directly appoints all the chairpersons of the judiciary as well as the rectors of public universities. The Parliament can only ratify his proposals. This means that Mozambican Parliament has very few chances to modify the decisions made by the President and the executive (Shenga, 2007). 23The 1994 first general election was a success, both in terms of organization and participation. About 88% of those entitled to vote (that is, 6.5 million Mozambicans) went to the polls, in quite a calm and peaceful climate, only broken from the Dhlakama’s encouragement to boycott the polls. Fourteen parties participated, presenting twelve candidates to the presidency. 24As widely foreseen, FRELIMO obtained an absolute majority in the Parliament, as its candidate, Chissano, was elected Head of State with a percentage of 53,3%, against Dhlakama’s 33,7%. The “political risk” did not become reality. 25Although RENAMO won a majority in some pivotal provinces, Chissano denied the possibility of giving it any significant role in those territories, continuing to appoint presidents belonging to FRELIMO. In addition, “the newly elected government proved reluctant to allocate the resources necessary to assure the independence of the legislature and the judiciary” (Alden, 2001, p. 73). People spoke of an excessive “frelimization” of the state, but the constant dialogue between Chissano and Dhlakama, the new role of media and consistent help from international donors to RENAMO helped to keep the situation under control. 26In 1998, the first municipal elections took place. RENAMO boycotted them, so only 15% of voters went to polls. FRELIMO won all 33 municipalities in the country. Only in the following local elections, in 2003, did RENAMO participate, winning in 5 municipalities, all in the Centre and North of Mozambique. This is the only example in which RENAMO’s representatives have had direct responsibility for governing the country. 27In 1999, the second general election was held. And here the “political risk” manifested itself, against all predictions. The abstention rate was higher than in 1994 election, reaching 33% of voters. The difference between Chissano and Dhlakama was very small, about 2%. RENAMO did not accept the results, claiming that about 8% of the votes had to be re-counted. Firstly, CNE – now directed by Rev. Jamisse Taimo, seen as “lacking the independence and near outsider status of his predecessor in 1994”, Brazão Mazula (Manning, 2002, p. 195) – accepted this suggestion, but afterwards confirmed the results of its provincial delegations. Then RENAMO applied to the Supreme Court, presenting 23 allegations of fraud or irregularities. They were all rejected, confirming Chissano’s victory (Manning, 2002). 28The Carter Foundation monitored the electoral process and produced a report ponting out some “technical problems” and the lack of transparency in the process of vote tabulation; nonetheless, it concluded that the 1999 elections showed a more mature political system and good implementation of the process on the election days (Carter Foundation, 2000). 29It is not possible to say if Dhlakama won or not. What it is possible to state is that FRELIMO faced this unpredictable “political risk” using a highly opaque approach. RENAMO was not given the chance to seriously check the contested votes. The same Carter Foundation expressed a positive opinion of the election, although with some reservations that could not change the final result of the polls. 30South African observers were surprised with the results: “Renamo did surprisingly well, especially in the legislative election, by capturing just over half of the combine votes cast in the country’s two most populous provinces, that is Nampula and Zambezia” (Lodge, Kadima & Pottie, 2002, p. 197). 31At domestic and external level, the “political risk” was managed in accordance with the methods chosen by FRELIMO: no one in the international community seriously contested the election results. RENAMO represented a risk for it too: and no one could allow it to break the wonderful image of an African country, able to successfully transit from a Marxist-Leninist regime to a democratic one. 32RENAMO, therefore, began to organize public demonstrations, claiming that the elections had been fraudulent and not transparent. The Mozambican institutions responded violently, alleging that RENAMO wanted to set up independent enclaves within national territory. The worst occurred in Cabo Delgado Province, when about 100 RENAMO demonstrators were captured by the police and led to a tiny cell in Montepuez. 83 of them died, supposedly from suffocation. This tragic incident occurred at the end of 2000. In November of the same year, Carlos Cardoso, the most prominent Mozambican journalist and director of Metical, was killed in Maputo because of his investigations into corruption in the financial sector, specifically the failure of the Commercial Bank of Mozambique (BCM) (Fauvet & Mosse, 2004). 33These episodes gave a clear idea of the essence of democracy in Mozambique. It was a pluralist country, but FRELIMO set down a clear limit: not to give power to RENAMO. Mozambican democracy revealed its real nature: it was actually “blocked” and it was less pluralist and tolerant. The “transition” from a Marxist-Leninist to a democratic system was abruptly interrupted. Another “transition” was emerging: from a theoretically open system to one in which the “political risk” had dictated its insurmountable limits. 34The third general election, in 2004, which enshrined Guebuza as the new Mozambican Head of State, implemented this strategy, reducing the spaces of democracy in all sectors of public life, starting with the media world, menacing the very existence of RENAMO as a political party. 35The principles of media freedom appeared in Mozambique with the approval of the new Constitution in 1990 (modified in 2004) and the Press Law (1991). Other laws indirectly deal with issues related to media freedom. In this point, a brief idea of these principles and their limits will be given, as provided for in the Mozambican legal framework. 36The principle of press freedom and freedom of expression enshrined in the Constitution arose from the struggle of a prominent and cohesive group of journalists on the eve of the approval of the 1990 Constitution. 37During the Marxist-Leninist period, information was part of the state strategy: during the first National Seminar on Information, held in Maputo in 1978, the Minister of Information Jorge Rebelo stated: “The immediate publication of a criticism by journalists constitutes, in practice, an attack on the Party and the State”. In summary, “Professional writers must be subordinated to FRELIMO’s discipline and guidelines with regard to the content and form of their writing” (Da Graça, 1992, p. 197; Jone, 2005, p. 23). Machado da Graça defines this approach as very violent, and thinks it did a great deal to help develop, in all Mozambican journalists, a sense of oppression and self-censorship, in part still present today (Da Graça, 1992, p. 198). 38In 1989, a group of journalists considered to be “leftists” (that is, basically, white Mozambicans of Portuguese origin, who had always criticized the FRELIMO Government from a left wing position), formed by Carlos Cardoso, Kok Nam, Fernando Lima and the photographer Rangel, noting the absence of the right to information in the first draft of the Constitution, proposed adding this basic principle to the definitive text. About 150 journalists signed this request, asking for a meeting with President Chissano. On 29 May, the meeting was held. After around 7 hours, Chissano accepted the proposal and Teodato Hunguana, Minister of Information and lawyer, was charged with writing this part of the new Constitution (Jone, 2005, p. 25). 39There are three articles that deal directly with the issue of press freedom in the Constitution: Article 48, on “Freedom of expression and information”, states that censorship cannot limit these fundamental rights. The state must guarantee the independence of all Mozambican newspapers from the Government, Administration and all other political powers. 40However, Articles 41 and 50 limit – although indirectly – the provisions established in Article 48. Article 41 states that the right to honor, the reputation of an individual’s public image, and respect for private life have to be established. This article has been used often, not so much to protect someone’s reputation, but to limit the free activity of journalists, especially when they are dealing with people in the public eye. 41Article 50 establishes the constitution of the Conselho Superior da Comunicação Social (CSCS) – High Media Council – as a public institution. Its main task is to discipline and control the information sector, guaranteeing the independence of the media in all the main fields. Therefore, the control of CSCS is exercised by a public institution, and its aim is to ensure the independence of the press and information from that same public power. This trend is accentuated by the Press Law – to be presented later – which establishes (Art. 35) that the President of the CSCS is not only directly appointed by but also accountable to the President. This leaves serious doubts as to the real independence of CSCS and its capacity to protect journalists’ freedom of expression and the dissemination of information. Hence, a first issue is raised: Mozambican law does not provide for an independent authority to regulate the system, delegating this paramount power to the state, through its operational arms. 42The Press Law (no. 18/1991) defines the concept of “right to information”, including the right to disseminate information, opinions and ideas by the press. For the first time, Mozambican law defines a “journalist” as someone who collects and disseminates information, carrying out this activity as his (her) main means of subsistence. Article 29 explicitly limits journalists’ activities regarding the collection of information. In paragraph 2, it states that free access to sources will be denied in the case of trials conducted “em segredo de justiça” (under judicial secrecy), in the case of documents or facts considered by the authorities to be secret for military or political reasons or those declared as secret or confidential due to legal imposition and, finally, in the case of information that deals with the private life of citizens. As we will see later, the issue of the relationship between the search for sources and respect for public secrets would be the main content of other specific laws, no. 12/79 and no. 19/91, as well as some measures included in the Penal Code. 43The other significant part of the Press Law is contained in Chapter VII, regarding Civil and Criminal Responsibility. Here, Article 41, paragraph 2, states that the journalism company is held responsible, together with the author of the article or the radio or TV program, for spreading information which should not be disseminated. Article 42 establishes the crime of abuse of press freedom, punishable according to common criminal legislation. 44Article 46 introduces the press crimes related to insults, defamation, threats, contempt and provocation against some important public figures, as the Head of State, all the members of the Government, MPs, judges and other, undefined public authorities, such as diplomatic representatives of foreign states in Mozambique, establishing an urgent procedure. 45Other limitations included in the Portuguese Penal Code are still in force in the country, having been approved in 1886. In Chapter V, Article 407, it clearly states that if someone defames another in public, orally, in writing or through an image or any other type of media, affecting his (her) honor, the offender will be sentenced to the prison for four months, and obliged to pay a fine. 46Another two laws that constitute an obstacle to press freedom are laws nos. 12/79 and 19/91. The first, approved under the Marxist-Leninist regime, establishes what is “state secret” in quite an arbitrary way, leaving the authorities a lot of room to define it at their discretion. Law no. 19/91, approved in the same year as the law on Press Freedom, specifies the nature of the crimes of defamation, insult and slander not in a generic way, but against state security. There is a vast range of public (not necessarily institutional) figures protected by this law, including the leaders of the main political parties or military exponents, a lack of respect for whom can lead to up to two years in prison. 47In 2004, the Mozambican Government approved a Decree (number 65/2004), following requests by the National Association of Advertising Companies, which in its section 5, states that the media cannot accept any advertisement that could offend the principles of the Constitution. Some think that “The roots of this specific stipulation go back to the former regime period, when the (now defunct) state-run advertising company, Intermarket, used national heroes and national icons for social marketing campaigns on subjects such as public health, general education, etc. (Mário, Minnie & Bussiek, 2010, p. 40). 48Finally, Law no. 16/2012 on Public Probity clashes with some fundamental rights of information. In particular, Article 69 states that (paragraph 1) it is not permitted to disseminate the income, or any financial matters, of “civil servants”. Offenders can be punished with a sentence that ranges from three days to six months of prison plus a fine. In the case in which the article published in the paper is anonymous, the director shall answer in the first person, together with the board (paragraph 3). Even a public information body, such as Radio Moçambique, noted that this new law goes against press freedom (Rádio Moçambique, 2012). 49The picture drawn above shows that several laws are directed towards protecting public figures: consequently, a serious limitation to journalists’ activities is established, depriving the public opinion of fundamental information on the life of their governors. 50Since “the culture of secrecy in the public administration is still very strong” (White, Bujitu & Macoo, 2006, p. 42), there has been an attempt to fill the main legal gaps. In 2005, a draft bill on free access to sources was submitted to the Parliament, but has never been discussed. This situation authorizes the public authorities to refuse clear dialogue with Mozambican journalists, “under the pretext of honoring ‘confidentiality’ and keeping ‘state secrets’” (White, Bujitu & Macoo, 2006, p. 43). 51Throughout the nineties, as the following points will show, political power rarely used the legal opportunities to limit journalistic activity. In fact, on the one hand, media power tended to increase constantly at the time, while political power was still in weak conditions; on the other, especially far away from Maputo and other urban centers, local authorities continued to use the “old” ways to influence journalistic coverage, such as harassment, prison and other forms of violence. However, when discovered, these actions were immediately condemned by Mozambican media and by central political power. 52The period between 1992 and 1999 probably represents the period in which the Mozambican press reached the peak of its freedom and effectiveness. 53As seen above, the new Constitution gave people (and the media) great opportunities to express their opinion and criticism, in a country hungry for news. Therefore, in few years, independent newspapers saw a strong increase in their circulation: they sold a total amount of about 51.000 copies per week in 1998, double in comparison with 1997 (US Department Of State, 1999). The independent weekly Savana used to sell between 17.000 and 20.000 copies per week, with a distribution in all the provinces of the country (Moyana, 1996). 54Three main independent media groups appeared in the nineties: the first and most solid one was “MediaCoop”, which published the fax newspaper Mediafax and the weekly Savana. This group was composed of the most prominent Mozambican journalists of the time, such as Carlos Cardoso, Fernando Lima, Kok Nam, Salomão Moyana, Fernando Veloso, and so on. It is currently the most important private media group, together with SOICO, created only in the 2000s. The second one was the “Cooperativa Artes Editorial” (CAE), which created the weekly Demos. The basic CAE group was composed of Noé Dimande, Elias Cossa, Palmira Velasco, Cassimo Ginabay, and others. Demos began its publications in 1995 and closed in 2005. Finally, the third group was represented by Carlos Cardoso and his collaborators, such as Marcelo Mosse, who decided to leave “MediaCoop” and set up a new group, which publishes Metical, a weekly newspaper via fax, characterized by its effectiveness and criticism in covering economic questions related to the politics of structural adjustment that the IMF and WB were implementing in Mozambique (Fauvet & Mosse, 2004). For many years, Metical and Demos made a deal: Demos gave over three pages to Metical, where Cardoso could chose the most interesting issues to put in. This agreement survived until Metical closed. 55Many factors obstructed the path to media freedom throughout the “transition” era, besides the legal ones outlined above. A great number of Mozambican institutions and the majority of FRELIMO’s members and leaders considered the media as an instrument that had to serve political power: this was the situation during the colonial epoch, and the same situation had been imposed by the Marxist-Leninist regime under the leadership of Samora Machel, with the figure of “militant journalism” (Vasconcelos, 1996). 1 Interview with Simeão Ponguane, Maputo, 11/09/2013. 2 Interview with Fernando Veloso, Maputo, 29/08/2013. 56“The rules were clear”, declared a witness of that time. “RENAMO’s movement had to be referred to as ‘armed rebels’ and it was explicitly prohibited to show images of Dhlakama or Savimbi. It was also impossible to criticize the FRELIMO party”1. Those who did not accept these rules had to leave the profession, as Fernando Veloso – the current Director of “Canal de Moçambique” – did, remembering: “At the end of 1982 I decided to stop my work in the delegation of Notícias in Beira, and I became unemployed. Nonetheless, I had to write a letter declaring that I continued to respect the FRELIMO party”2. 3 Interview with Simeão Ponguane, Maputo, 11/09/2013. 57The choice of a presidential system in Mozambique helped revive the idea that no one had the authority to criticize the Government and the public institutions. As Ponguane remembers, TVM was considered by FRELIMO’s managers to belong to them, so its journalists had no right to criticize the party in power3. But Chissano had a different position. The journalists did not have to be transformed, “em algum caso com êxito, em moleques às ordens” (sometimes successfully into puppets) (Da Graça, 1996, p. 187). On the contrary, Chissano understood that it was necessary to give space to media freedom and to overcome this stuffy and anachronistic mentality. International donors also imposed this approach as a condition to continue to aid a country that, at the time, was completely dependent on foreign financial support. As will be shown below, the Mozambican elite was not prepared to accept this supposedly high level of freedom, so confrontation with Chissano was frequent and serious. 58In a sense, the transition to democracy suffered from a gap between the political culture of the majority of the Mozambican elite and the formal features of the new Constitution. Chissano represented the link between these two elements; for this reason his approach in relation to media could seem ambiguous. His attitude was “liberal” but at the same time “dialectic”. 59“Liberal” for two specific reasons: on the one hand, he never used the court to deal with media criticism. On the other, he decided not to interfere directly in the activity of media, especially the public media, which could be better controlled. “Dialectic” because he used to face the Mozambican media head on, trying to improve their professionalism and define limits that could not be overcome. It was certainly a difficult acrobatic game, whose outcomes, at least until 1999, had been very positive. 60The Mozambican media generally focused its attention at this time on two aspects: the need to defend themselves from the direct attacks against journalists and journalism; building a new space to criticize political power freely. Of course, it was done in different ways, with a certain distinction between public and private media. But it was done coherently, showing a common, strong interest in designing a new role for freedom of expression. 61The cases in which press freedom was threatened by the Mozambican State (particularly by the police) through interference, threats and violence, were very frequent during this period. For instance, when Rosário Sweleque, a Rádio Moçambique (RM) journalist, was detained in 1994 for five days by the Nampula Police (North of the country) because of his critical coverage of the presidential visit to that province, the reaction of the public and private media was the same: the public daily newspaper Notícias had no fear in publishing a report (23/05/1994) and an editorial (27/05/1994), in which it very clearly explained its point of view, openly criticizing the police’s attitude (and, indirectly, the state’s). The title of the editorial is: “Informar vai custar prisão?” (Will informing mean prison?). Many episodes of corruption were reported by local press. On 21 August 1996, Demos opened its edition with a bombastic title and photo: “A polícia na malha do crime” (Police in the hands of crime). 62The arrogant approach by Mozambican Police was denounced also when there were serious violations of human rights against common Mozambican people. The two independent weekly newspapers, “Savana” and “Demos” in particular, more than “Notícias”, focused their attention on this subject, with effective reports on the very bad situation in Mozambican prisons and on abuses against lay people (Bussotti, 2013). 63Some editorials or opinion pieces reflect this situation. “Demos” published an interesting article by Aida Gomes to celebrate the 20th anniversary of independence, which defended that the openness to media freedom had been a precious outcome of the general process of liberalization, warning that the press never is completely free. 64One year later, Fernando Lima performed a reflection on the role of Misa-Mozambique, stressing the importance that this organization had for the country, four years after its foundation. Many other examples could easily show the lively debate that was occurring in this transition period in Mozambique. 65As stated before, Chissano’s attitude in relation to media was not only “liberal”: it was “dialectic”. In this case, “dialectic” means that Chissano entered in dialogue with the press, sometimes admitting his errors, in other cases criticizing strongly the approach of some journalists in relation to political questions. But never censoring the press. And, in some cases, he had to admit that Mozambican newspapers were right. The most famous of these cases was the one involving Manuel António, a contested Minister of the Interior, accused of incompetence, arrogance and corruption. The independent press carried out a violent campaign against him, and the international community did too. In addition, Manuel António refused to reform the Mozambican Police in spite of the atmosphere of insecurity present in the country, which led to the murder of the Swiss cooperation worker, Nicole Bezençon and a halt to the aid coming from that important country to Mozambique. Due to these international and media pressures, Chissano decided to replace Manuel António as his vice-Minister with Edmundo Carlos Alberto. This was probably the first, great success of Mozambican press in relation to political power. 66Another important case of this “dialectic” approach was a direct confrontation with Demos. Here, Cassimo Ginabay announced an imminent reshuffle in the government team (22 January 1997 edition). President Chissano responded directly, through an interview to the public weekly newspaper Domingo (26/01/1997), refuting the allegations presented by Demos, and deciding for a second time what measures to adopt (in truth, he did not adopt any legal measure). In his opinion, the article presented lies, offending the professional ethics of all Mozambican journalists. What further reveals the political culture of Mozambican institutions, besides the figure of the President, is the position assumed by SNJ. The President of its Ethics Council, Iain Christie, wrote a letter to Chissano, taking a stand for him against Demos. However, it suspended its opinion, since President Chissano too had announced that he would wait a while to decide what measures to take. In its 26 February edition, Demos published the opinion of the SNJ Ethics Council, as well as the opinion of Fernando Lima, astonished by the fact that the first formal act of the new SNJ was to address a letter against an independent newspaper. On the same page, Demos published the opinion of Paul Fauvet (Mozambican National Agency, AIM), who criticized the lack of professionalism of Demos, and the opinion of José Pinto de Sá, expressing the opposite. In this case, Chissano was direct and liberal at the same time, but it was clear that Mozambican organizations had not yet understood what role they had to play in a country characterized by independence and freedom. 67The “liberalism” of Chissano towards the media was visible especially when he received criticism. It happened very often: Cardoso’s articles in Metical against the policies of liberalization and privatization constitute a prominent example of investigative journalism in an African country such as Mozambique. But Chissano was called directly into question for other cases too, such as the one relating to the BPD Bank. For many weeks, between September and October 1997, the local press questioned if Chissano’s family was one of the shareholders of this Bank or not. Carlos Cardoso and Demos carried out an investigation campaign on the issue. But President Chissano did not hinder the publication of these articles, nor did he go to court to invoke defamation. 68This climate of respect between political power and press extended beyond Chissano to other prominent institutional figures. Manuel António’s substitute as Minister of Interior, Almerino Manhenje, wrote a letter thanking Demos for its reporting on the very poor management of the Police Training Center in Matalane (Maputo Province) by Commander João Zimaima Manuel. In his letter to Demos, the Minister underlined that “this approach of denouncing incorrect behavior is something that deserves our attention because it contributes to the good health of our institution”. 69The “indirect rule” Chissano decided to adopt included measures aimed at promoting press freedom and investigative journalism. This is true for the all the public media outlets: TVM, RM, Notícias and Domingo. All the informants interviewed confirmed that political interference was limited during the nineties. 4 Interview in Maputo, 11/09/2013. 70Simião Ponguane, a journalist at TVM since 1988 and Information Director from 2003 to 2010, stated that “Chissano was very liberal, he has been always tolerant”4, respecting journalists’ work. The confirmation of this opinion can be found by analysing the President’s approach to the Carlos Cardoso case: Chissano’s deceased son, Nympine, was formally accused as the main suspect of this Cardoso’s murder. The whole case was covered by media and had a very significant public impact. 71TVM (Mozambican Television) case, involving journalist Francisco Junior, is another important evidence of the cultural gap between Chissano and the Mozambican institutions. Before the signing of the General Peace Agreement in Rome (1992), Francisco Junior asked Chissano a question as he was leaving a meeting. Chissano abruptly silenced him. Then, Francisco Junior was immediately removed, disappearing from TVM. The decision had been made by TVM chiefs, who interpreted Chissano’s irritated gesture as an implicit order to marginalize the journalist. The same Chissano called Francisco Junior again, inviting the TVM Director to readmit him to his normal work5. 6 Interview in Maputo, 12/09/2013. 7 Interview in Maputo, 18/09/2013. 72The former Director of Notícias, Bernardo Mavanga, confirms that, in his experience, he “never suffered political pressures, having always been guided by free, investigative journalism, even if he knew that some of FRELIMO’s representatives had privileged contacts with some journalists at Notícias6. Rogério Sitoe, who was Vice-Director of Mavanga in the nineties and then Director of Notícias (from 2003 to 2013), points out that during Chissano’s Presidency, he never suffered direct influences by the FRELIMO party or by the Mozambican Government. The influences could be informal, but there were no direct orders coming from politicians or institutions7. 8 Interview in Maputo, 10/11/2013 with an RM journalist who asked to remain anonymous. 73RM too was conducted using the same criteria of absence of interference. In this case, Chissano went further, choosing to name Manuel Veterano as CEO of RM in 1997, and was subject to internal accusations that he had handed the most important media in the country over to a supposed member of RENAMO8. The result was that RM was recognized as the freest of the Mozambican public media outlets. 9 Interview in Maputo, 29/08/2013. 74A journalist who was very critical of FRELIMO’s power management, Fernando Veloso, stressed that at the beginning of nineties “there had been a gust of fresh air, thanks to Chissano”, even if this new atmosphere of freedom was “contextualized” and not “absolute”, since the perimeter was defined.9 And this atmosphere continued until approximately 1999, when three specific events partially changed this scenario. 75This point will discuss how the unpredictable political risk represented by the actual possibility of a RENAMO electoral victory completely transformed the nature of Mozambican political power, with a direct impact on its relations with public media. 76In this case, the “transition” of Mozambican democracy shifts.The move towards the construction of democratic institutions and improving a mentality inspired by the values of tolerance and acceptance of criticisms stops, favoring another kind of transition: one centered on an explicit concept of “blocked democracy”, whose main aim is to manage the political risk constituted by the electoral win for RENAMO. 77The nature of the Mozambican state changes: all Mozambican institutions will have to pay particular attention to this question, finding ways to avoid this risk becoming reality. And public media are also forced to take a new approach in relation to all the most sensitive political questions. 78The three pivotal facts that alter the political atmosphere are the following: the uncertain results of the 2nd general election and the sharp protests by RENAMO, which did not accept the results issued by the CNE (National Electoral Committee) (Jone, 2005) and decided to organize public demonstrations in the Centre and North of the country. As a result, more than one hundred of RENAMO’s members were imprisoned by the Police in Cabo Delgado Province, led into the tiny cell at Montepuez, where they died some days later, supposedly for lack of air. The last is the murder of the most famous and respected investigative journalist in Mozambique, Carlos Cardoso, Director of Metical. 79The 1999 general election was waited anxiously by FRELIMO’s representatives. 80Notícias increased dramaticallyits institutional nature almost cancelling RENAMO out of its electoral reports. It was a very different situation in comparison with what the same paper did in 1995, when it covered the Mutarara case, in which RENAMO’s MPs were arrested by the Police for no specific reason. At that time, Notícias entitled its piece: “Polícia não tem ordem para perseguir membros da Renamo” (Police does not have orders to persecute Renamo’s members). For instance, when Dhlakama was blocked by FRELIMO’s members in Chokwé during his electoral campaign, Notícias (27/10/1999) wrote as follows: “the forces of law and order witnessed this sad spectacle without taking action, which in turn aroused public fury”. No mention was made regarding who blocked Dhlakama’s electoral campaign or that FRELIMO imposed the closure of all the schools, since children had to participate in sabotaging the leader of the main opposition party. 81On the same topic, Savana (29 October 1999 edition) stressed that the people who blocked Dhlakama were directed by Zacarias Zuma, the first secretary of FRELIMO in Chokwé district. Local people told the Savana reporter that no child went to school, by order of the local authorities (Manning, 2002). 10 Interview with a RM journalist who asked to remain anonymous. Maputo, 10/11/2013. 82RM too organized an extremely deep type of coverage, sending its reporters into the most critical provinces, such as Nampula, Sofala and Zambezia. According to our source, this coverage was unique during Chissano’s government, and only in 2013 saw something similar10. RM adopted coverage of the events that aimed “to demonize RENAMO, presenting the party as the real guilty party in the tragedy”11. 83The TVM coverage was biased, clearly favoring the electoral campaign of Chissano and FRELIMO. 84The same scenario occurred in the coverage of public media regarding the Montepuez case. The “political risk” had not yet passed, and RENAMO was using a violent discourse, threatening possible secession from Maputo as a reaction to the supposedly fraudulent electoral results. 85The best example to explain the shift in the attitude of public media after the 1999 events is given by Notícias. Here, all the coverage is presented through a constant denigration and a negative image of RENAMO. Despite the doubts expressed by the Prime Minister, Pascoal Mocumbi, about the official version of the death of more than 80 members of RENAMO in the Montepuez cell, Notícias emphasized the fact that “não houve violência” (there was no violence). In one case, a reporter advanced an alternative hypothesis, which returned throughout the debate: there had been violent action by the “Naparamas”, described as “homens que se diz terem poderes sobrenaturais e que tiveram um envolvimento directo no conflito armado recentemente terminado no país” (men who are said to have supernatural powers and who had a direct involvement in the armed conflict that recently ended in the country). The witnesses present in the cell on the night of the massacre alleged that the “Naparamas” had beaten a great number of the prisoners who later died. 86This “window” was closed immediately; in the article of the following day, 25 November, Notícias gave the conclusions of the case, later confirmed by the Court: the prisoners died from suffocation. 87Once the legal aspects had been clarified, the new objective of Notícias was to reverse the accusations of many observers against RENAMO. This was done using questionable journalistic methods, from a technical and from an ethical point of view. Local people supposedly interviewed declared that they were tired of Dhlakama and RENAMO’s behavior. In the edition of 1 December, the title of the piece was: “População de Montepuez quer justificações de Dhlakama” (Montepuez inhabitants want explanations from Dhlakama), and the lead added: “…e exige pena pesada para Manuel Secundino Cinquenta” (…and demands a heavy punishment for Manuel Secundino Cinquenta, the local person responsible for RENAMO). The other source in the article is the Cabo Delgado Governor, José Pacheco, who also underlined Dhlakama’s responsibility in relation to the “crimes which were committed”. 88This atmosphere of “anti-Renamism” was encouraged by Notícias in the following editions too. On 6 December, Jaime Cuambe wrote an op-ed (“Sentido de Estado ou ‘República das Bananas’?”, Statesmanship or Banana Republic? ), in which he tried to mock the image of RENAMO and its leader. This strategy aimed to stress RENAMO’s lack of political preparation, pushing the deaths at Montepuez into the background. 89The private press coverage was completely different. It showed indignation at the Mozambican State, which not only let almost one hundred people die in its cells, but – through public media – tried to reverse the accusation against the victims, RENAMO’s members. Probably for the first time, the private media discovered the real nature of Mozambican democracy: that is, they clearly understood that a political alternative to power through free elections would be impossible. 90Savana covered the Montepuez events mainly through comment pieces. Its columnist Machado da Graça wrote a first article (15/12/2000) entitled “Barbaridades nas cadeias moçambicanas” (Barbarities in Mozambican cells), according to which the Montepuez events represented a veritable “barbarity”. 91Two editorials were presented with the same content and the same rhetorical techniques: a prolonged use of alliteration at the end of the article, by repeating rhetorical questions. The title of the first (published on 25/05/2001), is: “Os intocáveis do ‘caso Montepuez’” (The untouchables of the ‘Montepuez case’). The article closure is built around the use of the word “chega” (“enough”), stressing that the tolerance of Mozambican people has already come to an end with the Montepuez massacre. The state is represented as a “falso Estado de Direito” (having a false rule of law), since “Não se pode responsabilizar meia dúzia de subalternos pelo massivo genocídio ocorrido em Montepuez” (It is impossible to hold half a dozen subordinates responsible for the massive genocide that occurred in Montepuez). So, as well as the prison guards and the generals, the Minister of the Interior himself had to be judged. In fact, they had not been involved by the court; hence it is possible to deduce that, in Mozambique, only the “peixes miúdos” (“small fry”) have to pay, while the “big ones” are “untouchable”. 92In its editorial on 27 January 2001, after the sentence was announced, Savana published an editorial whose title was: “‘Caso Montepuez’ encerrado?” (Is the Montepuez case closed?). The article expresses Savana’s disdain, since the judgment given by the Cabo Delgado Court was presented as absolutely inadequate and unfair. The court, condemning only “o mais subalterno dos subalternos” (the most subordinate of the subordinates), indirectly violated Article 97 of the Mozambican Constitution. It declares that the state is responsible “pelos danos causados por actos ilegais dos seus agentes” (for the injuries caused by illegal acts of its agents), and has the obligation to compensate the victims’ families. 93Finally, in the edition of 16 November 2001, Savana widely reported Amnesty International’s comments on the case, whose key meaning was represented by a letter sent to President Chissano, asking for a review of the judgment, since the sentences imposed on the RENAMO sympathizers were considered to be unfair; consequently, Amnesty International invited the Head of State “no sentido de se repor a justiça” (to reinstate justice). 94Metical was probably the Mozambican newspaper that adopted the most aggressive and investigative approach. In its edition of 6 December 2000 (published in Demos too), an entire page was dedicated to the Montepuez case. As usual for Carlos Cardoso’s pupils, Metical was able to collect an “alternative” version in relation to the official one. According to it, the prisoners died of suffocation, but they had not eaten since 12 November, that is, approximately ten days. This accelerated their fate. The paper’s comment was as cutting as it was clear: “The state summarily killed 83 citizens inside a cell in very precarious conditions”. So, the state “has to take responsibility” for this tragedy. A short comment in Metical, on the same page, links Cardoso’s murder with the Montepuez tragedy: in the sense that Cardoso struggled for those common and insignificant people who died in the cell in Montepuez. In short, the logic of these killings was the same: to end democracy and criticism of power. 95The consequences of the 1999 general election on the Mozambican media are evident: the solidarity between public and private press in defending the right to information broke. From this moment on, public and private press would embark on two different and even divergent paths: the former permanently concerned with safeguarding the state and its institutions, despite the seriousness or tragic nature of events; the latter with a strong tendency to emphasize the need to build an effective rule of law, strongly threatened by the same institution that should guarantee it. 96The new atmosphere of fear in the country and even more within Mozambican media grew with the killing of Carlos Cardoso, which took place in Maputo on 22 November 2000. In this case, public and private media covered the event in a complete way. Nevertheless, the impact it left on the sense of freedom and security among Mozambican’s journalists was terrible (Committee to Protect Journalists, 2001a). 97In July 2001, a team from CPJ visited Mozambique, and discovered an atmosphere of fear in the coverage of “sensitive issues”, such as corruption or big business, and also because the investigations to discover the Cardoso’s killers seemed to be inadequate (Committee to Protect Journalists, 2002, p. 2). The new situation provoked a fall in investigative journalistic activity. CPJ stresses that press freedom in Mozambique was “highly compromised” by Cardoso’s murder and the ineffectiveness of the inquiry (Committee to Protect Journalists, 2002, p. 2). 98The Cardoso case has been very important, in a negative sense, even after the murder of this journalist. In fact, Nympine Chissano the former President’s sonwas formally accused as the suspect of the Cardoso murder. Nevertheless, his situation will be clarified only between 2005 and 2006. In the years that immediately followed the murder, Marcelo Mosse, former chief reporter of Metical, wrote an article (in 2001) showing the probable involvement of Nympine in the Cardoso’s assassination. These were published in the Mail and Guardian and in the Portuguese Expresso too. Nympine Chissano moved for criminal proceedings for slander against Mosse and Metical, asking for a compensation of about 80.000 USD, but no legal proceedings were taken against the other two famous newspapers. This request induced Metical to close its publications, putting the two heirs – Cardoso’s minor children – in a very difficult situation (Hanlon, 2002). For this reason, an international campaign was organized by the most prominent organizations that fight for press freedom in the world, such as Reporters Without Borders, Article 19, CPJ and others. So, at the beginning of 2001, CPJ decided to write a letter to President Chissano, in order to stress the “ongoing persecution of Marcelo Mosse, formerly chief reporter for the now defunct daily “Metical”, on criminal defamation charges” (Committee to Protect Journalists, 2001b). The risk was that the court could adhere to Chissano’s son’s request, creating a situation of enormous injustice, besides the seriousness of Cardoso’s murder. 12 Interview in Maputo, 29/08/2013. 99Fernando Veloso testified that following Cardoso’s murder “everyone was quiet. I, too, wanted to stop being a journalist”12. 100During the 2003 ceremony to install the new members of Mozambique’s High Media Council (CSCS), Chissano, “while usually supportive of media freedom”, “publicly warned the local press against ‘sensationalism’”. He was immediately followed by Julieta Langa, the CSCS chairperson, who defended that the “press embraces speculation [and] does not practice constructive journalism” (Committee to Protect Journalists, 2004). Just one month later, in April, the Supreme Court Justice made a similar accusation, warning journalists that it would take “legal action” against reporters who defamed the court in their articles. Mario Mangaze, the Supreme Court Chief, filed a criminal defamation case against “Zambeze”, which had published an article accusing him of being corrupt. Mangaze also threatened to sue Mediafax (Committee to Protect Journalists, 2004). 101These simple facts show how the atmosphere of relative tolerance established immediately after the signing of the GPA in 1992 diminished, in favour of a different approach to democracy, starting with the Head of State. Of course, this shift directly influenced public media, whose levels of autonomy also decreased dramatically because of the opening of a new transition. 102The hypotheses formulated at the beginning of this article have been confirmed: the “political risk” constituted by RENAMO’s electoral win represents the real “block” and limit to Mozambican democracy, beyond which it cannot go. 103Since this risk did not come to pass, the progress of Mozambican democracy has been decided quickly. When it occurred, the reaction was as strong as it was violent, with direct impact on media freedom, especially for the public media. 104With the “transition” era finished in Mozambique, a new transition began in 1999-2000. This reduced the spaces of free debate, through stricter control of the media and other social organizations. 105In 2004, Chissano ended his second mandate as Mozambican President and left power. The newly elected President, Armando Emílio Guebuza, found fertile ground beneath his feet. He will encounter the favour of the most conservative and unscrupulous part of Mozambican society, ready to sustain the shift towards less freedom in the Mozambican media. Alden, C. (2001). Mozambique and the Construction of the New African State: From negotiations to nation building. New York: Palgrave. Bayart, J.-F. (1993). The State in Africa: The Politics of Belly. London & New York: Longman. Bertelsmann Stiftung. (2012). Mozambique Country Report. Gütersloh: Bertelsmann Stiftung. Bussotti, L. (2013). A cobertura das violações dos direitos humanos por parte do Estado na imprensa moçambicana. O caso de “Notícias” e “O País” (2008-2009). Africa Media Review, 1-2. Caporale, R. (1994, October 27). La pace da un miliardo di dollari. La Repubblica. Committee to Protect Journalists. (2001a). Attack of the Press in 2000: Mozambique. In https://cpj.org/2001/03/attacks-on-the-press-2000-mozambique.php (accessed 11 November 2013). Committee to Protect Journalists. (2002). O Assassinato de Carlos Cardoso. In https://cpj.org/reports/2002/05/moz-may02-pr.php (accessed 11 November 2013). Committee to Protect Journalists. (January 16, 2001b). Letter to the President of Mozambique, Joaquim Alberto Chissano. In http://www.refworld.org (accessed 11 November 2013). Da Graça, M. (1992). Luta pela liberdade de imprensa em Moçambique desde a independência. Intercom, 15(2), 194-202. Da Graça, M. (1996). Liberdade de Informação. In Ribeiro, F., & Sopa, A. (Eds. ), 140 anos de Imprensa em Moçambique. Maputo: Associação Moçambicana da Língua Portuguesa. De Brito, L., Castel-Branco, N., Chichava, S., & Francisco, A. (2010). Economia extractiva e desafios de industrialização em Moçambique. Maputo: IESE. De Rienzo, P., & Hanlon, J. (2007). Contested Sovereignty in Mozambique: The Dilemmas of Aid Dependence. GEG Working Paper 2007/25. Deutschen Gesellschaft für Internationale Zusammenarbeit. (s.d.). Mozambique. In http://www.giz.de/en/worldwide/320.html (accessed 2 December 2013). Fauvet, P., & Mosse, M. (2004). É proibido pôr algemas nas palavras. Lisboa: Caminho. Friedrich-Ebert-Stiftung & Media Institute of Southern Africa. (2012). Barómetro Africano da Media. Moçambique 2011: o primeiro exercício de análise concebido localmente sobre situação dos media em África. Windhoek: Electronic ed. Hanlon, J. (1991). Mozambique: Who Calls the Shots? London: James Currey. Hanlon, J. (1996). Peace Without Profit: How the IMF Blocks Rebuilding in Mozambique. Oxford: Irish Mozambican Solidarity & International African Institute. Hanlon, J., & Smart, T. (2008). Do bicycles equal development in Mozambique? Oxford: James Curry. Jone, C. (2005). Press and Democratic Transition in Mozambique 1990-2000. Johannesburg: Institut français d’Afrique du Sud. Lodge, T., Kadima, D., & Pottie, D. (Eds.) (2002). Johannesburg: Electoral Institute of Southern Africa (EISA). South Africa: EISA. Lundin, I. B. (2004). Towards Stable Electoral Laws in Mozambique. African Journal on Conflict Resolution, 4(2), 97-118. Macamo, E. (2004). Um País Cheio de Soluções. Maputo: Produções Lua. Manning, C. L. (2002). The Politics of Peace in Mozambique: Post-Conflict Democratization, 1992-2000. Westport: Praeger. Mário, T. V., Minnie, J., & Bussiek, H. (2010). Mozambique. Johannesburg: Open Society Foundation. Moyana, S. (1996). Savana: Um projecto em execução. In Ribeiro, F., & Sopa, A. (Eds. ), 140 anos de imprensa em Moçambique. Maputo: Associação Moçambicana da Língua Portuguesa. Ncomo, B. L. (2003). Uria Simango. Um homem, uma causa. Maputo: Edições Novafrica. Nuvunga, A. (2006). Multiparty Democracy in Mozambique: Strenghts, Weakness and Challenges. Johannesburg: EISA. Rádio Moçambique. (2012). Moçambique: Lei da Probidade Pública com pontos que ferem a liberdade de imprensa. In http://www.rm.co.mz/index.php/programacao/item/7682-banco-mundial-financia-pesca-em-mocambique.html (accessed 27 November 2012). Reporters Without Borders. (2012). Press Freedom Ranking 2011-2012. In http://www.en.rsf.org/press-freedom-index (accessed 12 December 2013). Reporters Without Borders. (2013). Press Freedom Ranking 2013. In http://www.en.rsf.org/press-freedom-index (accessed 12 December 2013). Rocca, R. M. D. (1994). Mozambico. Dalla Guerra alla pace. San Paolo: Cinisello Balsamo. Rønning, H. (2009). Strenghts and Weaknesses: Political Change and the Media in Africa Since the 1990s. In Rønning, H., & Orgeret, K. (Eds. ), The Power of Communication (pp. 25-65). Oslo: UNIPUB. Shenga, C. (2007). The Quality of Democracy: An Analysis of the Mozambican Legislature Capacity and Responsiveness. In http://www.cssr.uct.ac.za/sites/cssr.uct.ac.za/files/ALP%20conference%20paper%20Mozambique.pdf (accessed 12 December 2013). The Carter Center. (2000). Observing the 1999 Elections in Mozambique. Final Report. Atlanta: The Carter Center. US Embassy in Mozambique (2012). Doing Business in Mozambique. In http://maputo.usembassy.gov/doing-business-local.html (accessed 12 December 2013). Vasconcelos, L. (1996). Algumas reflexões sobre a imprensa pós-independência. In Ribeiro, F., & Sopa, A. (Eds. ), 140 anos de Imprensa em Moçambique. Maputo: Associação Moçambicana da Língua Portuguesa. White, J., Bujitu, D., & Macoo, I. (2006). SADC and Media Law: Mozambique. A handbook for media practitioners. Johannesburg: Konrad Adenauer Stiftung. 5 Information obtained by TVM journalists and former journalists, at the time colleagues of Francisco Junior, who asked to remain anonymous. BUSSOTTI, Luca. Media Freedom and the “Transition” Era in Mozambique: 1990-2000 In : Media Freedom and Right to Information in Africa [en ligne]. Lisboa : Centro de Estudos Internacionais, 2015 (généré le 24 avril 2019). Disponible sur Internet : <http://books.openedition.org/cei/164>. ISBN : 9782821879515. Bussotti, Luca. “Media Freedom and the “Transition” Era in Mozambique: 1990-2000”. 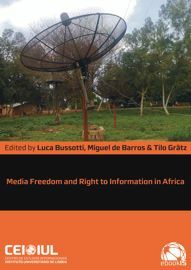 Bussotti, Luca, et al.. Media Freedom and Right to Information in Africa. Lisboa : Centro de Estudos Internacionais, 2015. (pp. 45-71) Web. <http://books.openedition.org/cei/164>. BUSSOTTI, Luca (dir.) ; DE BARROS, Miguel (dir.) ; et GRÄTZ, Tilo (dir.). Media Freedom and Right to Information in Africa. Nouvelle édition [en ligne]. Lisboa : Centro de Estudos Internacionais, 2015 (généré le 24 avril 2019). Disponible sur Internet : <http://books.openedition.org/cei/145>. ISBN : 9782821879515. Bussotti, Luca, et al., ed. Media Freedom and Right to Information in Africa. Lisboa : Centro de Estudos Internacionais, 2015. Web. <http://books.openedition.org/cei/145>.